I know, I know, I said no more buying books. But as I mentioned in a previous post, I am off to Paris soon. I am beyond excited about this trip, but unfortunately there is a fair bit of traveling involved before I arrive in Paris. Between the taxis and busses and the 9-hour flight, I just know I will get bored, and nothing quells boredom like a good book. Now I, like many, love going to the library to check out books. It is a super easy and cost-effective way to read books and try out works by new authors. But I don’t really feel comfortable taking a library book to another continent where it could get lost or damaged. I know there is no such thing as a library version of a permanent record, but in case that does come to exist, I don’t want to be known at my local library branch as the girl who wrecks books and accrues months of late fees because the books go missing. Hence this pre-Paris book haul was necessary (like how I’m justifying it to myself?) Besides, being stuck on a long-haul flight with a book that isn’t living up to its reputation or is just not sucking you in is a drag. 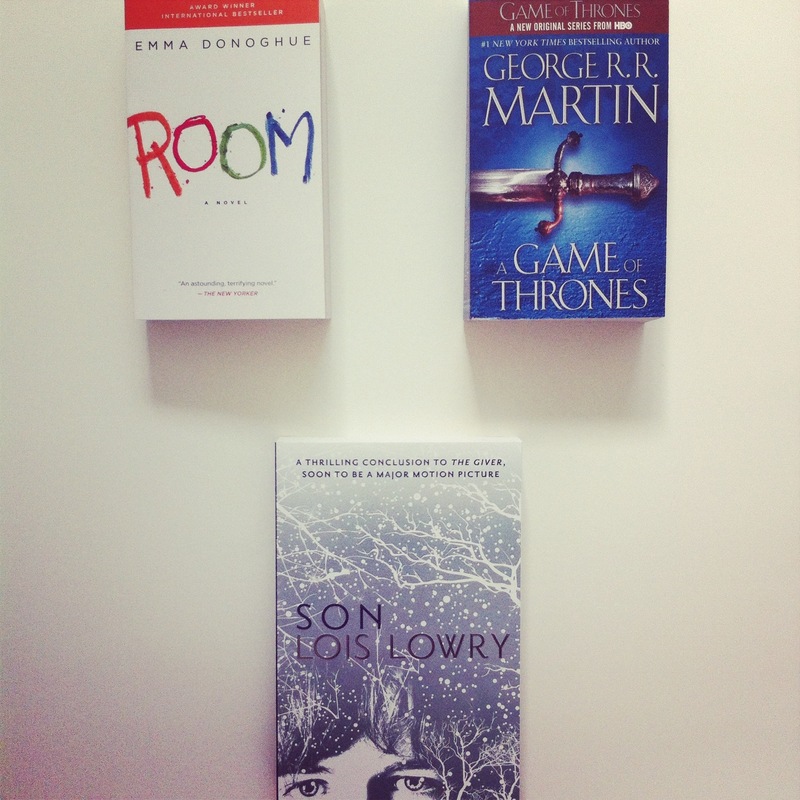 So, the three books I picked up are Room by Emma Donohue, A Game of Thrones by George R. R. Martin, and Son by Lois Lowry. I got all of these in paperback because they are lighter and smaller, and therefore easier to pack. I know that I will love these books, which is why I have selected them as the three books that will be coming on my trip with me. I don’t want to have any unnecessary book weight in my carry-on from books that I don’t plan on reading, or am doubtful as to whether or not I will like them. But who knows, maybe I’ll pick up a few more books while I’m in Paris to weigh down my suitcase on the flight home. Perhaps they’ll even be in French. . .
Have fun! Make sure you sit on the lawn in front of the Louvre and eat a delicious bagette. Hope you check out my debut novel THE WAITING ROOM (when you’re off a buying ban haha)! I do too, but it sounds like an incredible read. You will love Room, it is a really emotional read. great post! I am really looking forward to it!! !